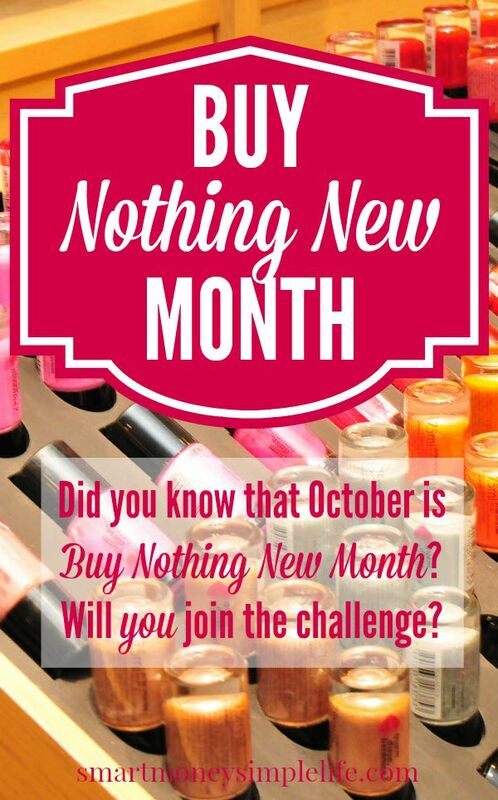 Did you know that Buy Nothing New Month is October? Will you join the challenge? Buy Nothing New Month is a great way to challenge the way you approach your day to day life. Too often we blindly accept today’s throw away mentality or we think it’s ok, it’s recyclable. Meanwhile, our homes, garages and storage units are bursting at the seams. It’s expensive and stressful! If you’re aiming to be more frugal, reduce your clutter and simplify your life, a no spend month is an absolute must. Yes, it’ll be a challenge but, you’ll gain so much more from the experience than just money in your pocket. Remember, it’s not about deprivation, it’s about finding other ways to access to whatever it is you need. Can you borrow it? Can you buy it second hand? Can you repair what you already have? It’s also about valuing what you have and making it last. You can make your pledge to “beg, borrow, barter, swap or buy second hand whatever you need” for the month of October at the Buy Nothing New Month website here. Remember, it’s just one month where you challenge yourself to buy nothing new, except essentials like food, hygiene and medicines. You can even add it to your 30 day challenge list! And, take a look this quick (5 minute) TED talk. Not just because it’s fun, but because it’ll challenge your creativity, too. Are you ready to give Buy Nothing New Month a shot? It starts in just a couple of days so there’s no time to lose! I don’t think you can fail this challenge. Even if it stops you from buying just one new thing – that’s a win! I am trying to live the “buy nothing” lifestyle year-round! Unfortunately, I can’t do it this time. I need to start buying Christmas gifts so I’m not behind come December. I have lots of nieces and nephews! Me, too! The less stuff that comes into the house (new or not) the better. Christmas… this year I’m looking for experiences for the youngsters in the family rather than ‘stuff’. It’s an interesting challenge. Sometimes the simplest solutions are the best one, I didn’t know October was the month to do it but with folks looking to save ahead of the holidays it’s a great idea. Every little bit before the holidays helps! Plus, it’s good to have a reason to stop and think before handing over money for more ‘stuff’. I love the idea of it but I’m afraid something would come up. For instance last month I had no idea a curling iron would land on my arm. Now bandages I think are a necessity, but I also bought a sleeve to hold the bandages in place because i’m on a volleyball league and couldn’t just quit. I think I have random stuff like that happen to me all the time. But I do love the idea, which is why for most things (like furniture and clothes) I either look for it for free, or maybe do a trade, or buy used. I hope your burn is healing well Tonya. Nasty things! So are curling irons!!! I haven’t done this specifically in October, but I have at other times of the year. I don’t think I bought anything new over the summer excluding things like groceries and personal care essentials like toothpaste. Challenging ourselves to limit spending is a great exercise for sure. I’ve done a few no-shopping periods before. They’re definitely challenging, but they also make you think about why you’ve been purchasing things and force you to develop better spending habits. I think it’s a great idea for anyone who’s been overwhelmed with the amount of things they have and need to save for the holidays! Agreed! Too often we spend out of habit. And, awareness is the first step. This sounds like a great challenge! I did a “buy nothing but food” challenge last month, but I guess challenge is the wrong word, as I was doing an internship in the middle of nowhere and had very few chances of buying things… I probably have to repeat that challenge while in my regular routine. Ha ha ha… The ‘middle of nowhere’ does have its benefits!